A Town Divided: Allen Iverson And Hampton, Va. Before Allen Iverson became an NBA All Star, he was a kid in Hampton, a town whose black and white populations lived in separate worlds. A new documentary by director Steve James, of Hoop Dreams fame, looks at a notorious brawl that nearly cost Iverson his ticket to the NBA — and highlighted deep divisions in the hometown that the filmmaker and subject shared. Divisions define Allen Iverson. On one hand, basketball fans praise his athletic gifts: With his signature crossover dribble, he led the Philadelphia 76ers to the brink of an NBA title. On the other hand, they decry his misbehavior: A notorious bowling-alley brawl nearly ended his playing days before he turned 18. The fight exposed the deep racial divisions that define Iverson's hometown, Hampton, Va.
That's also the hometown of director Steve James, who made his name with the film Hoop Dreams. And those divisions are at the heart of James' new documentary, No Crossover, which debuts Tuesday on ESPN. As James tells NPR's Steve Inskeep, "I come from a community where sports is king — and high school sports in particular." Excelling in both football and basketball at Bethel High School, Iverson was what James calls "transcendent" — perhaps the best athlete the town had ever seen. Immediately after Iverson, a junior quarterback, led his football team to a Virginia state title, he vowed to do the same in basketball. And he did. "So for this athlete to so divide the community," James says, "I just thought, there must be something larger at work here than just a fight in a bowling alley, even a racial fight." No Crossover includes a short camcorder clip of the melee that erupted at Hampton's Center Lanes bowling alley on Valentine's Day in 1993. It includes a lot of confused yelling and shouting, with images of young men forcefully throwing chairs at other people. The cause of the brawl has long been disputed. Iverson and three friends said a white man used a racial epithet; that man said he was minding his own business when Iverson provoked him. "The only facts that no one disagrees about," James says, "is that there was a fight in the bowling alley, and it was racial." Iverson was arrested; a judge sentenced him to 15 years for his role in the fight — an incident in which no one was seriously injured. None of the white men from the bowling alley was charged. "What's interesting is that the charge that Allen and his co-defendants were charged with," James says, "was this statute called 'maiming by mob,' which was put on the books in Virginia after the Civil War to protect blacks from lynching." The law allowed prosecutors to charge Iverson and the others with being present at the brawl; it didn't require proof of their participation. 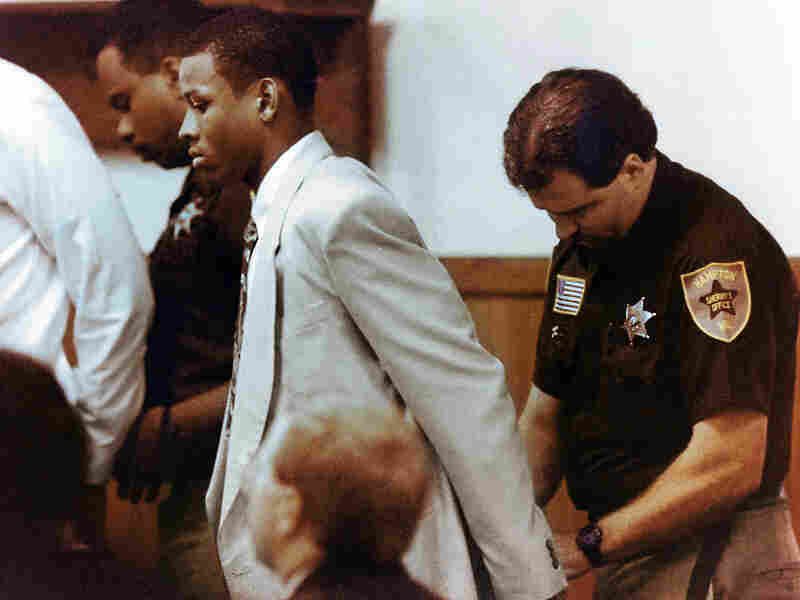 Allen Iverson's role in a brawl when he was a teenager brought a prison sentence of 15 years. He served four months and was granted clemency. An appeals court later threw out the verdict. Iverson was granted clemency and released after four months in prison, and an appeals court eventually overturned the conviction, citing insufficient evidence. The case shook a racial fault line that had been dormant among Hampton's community. "Whereas many of the people in the black community, but not exclusively, felt that they were trying to make an example of this kid." Two decades before Iverson hit the court for Bethel High, James played basketball for Bethel's arch-rival, Hampton High. The filmmaker says that at his school's pep rallies, black and white students would not sit together. Instead, they faced each other across the school gym. "When a white player was introduced," James says, "the white side would cheer. And when a black player was introduced, the black side of the gym would cheer." The Iverson case stirred racial tensions that James traces to Hampton's earliest history as a primary landing point for ships that brought African slaves to America. "People said this case caused more division within the community of blacks and whites than at any time since the assassination of Martin Luther King," James says. "And this is just a bowling alley brawl, in which three or four people suffered basically minor injuries." The brawl isn't the only part of Iverson's life James deals with in his documentary. The film also details his upbringing — he was the son of a single mother who was just 15 when he was born. Growing up, Iverson was often left to fend for himself and his baby sister. "This is a kid who came from a very tough background," James says. Today, with Iverson's NBA career all but over, some people may remember him mostly for the trouble he's gotten into. But James says they should consider another view. "Allen Iverson, in many respects, is a survivor. I mean, for a kid like him to even end up at Georgetown, and in the NBA — there are many kids who come from that kind of background who have tremendous athletic talent that never get that far." 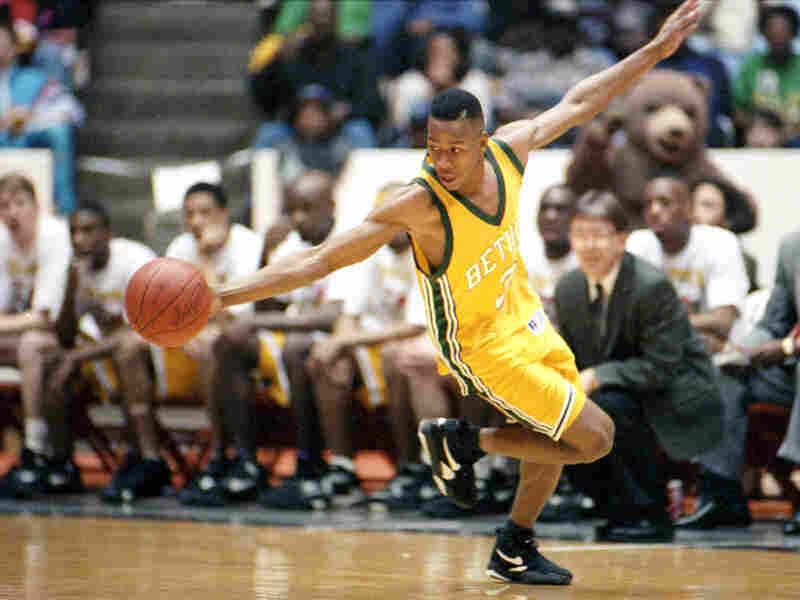 Allen Iverson gains control of a ball in a 1993 Bethel High School game. Iverson led the team to a state championship that year — the same year he was sentenced to prison. Iverson did not participate in the filming of No Crossover. And that isn't such a bad thing, James says. "Allen not participating allows us to focus the film much more on the community" — and on what Iverson meant to the people of Hampton, James says. Still, he admits to wanting to talk with Iverson — but not about the bowling alley incident. "I'm really interested to just talk to him about the place he's from, that we're both from," James says. "And then, when this happened, how did that change the way he looked at his community, and the way he looks at himself?"